This document was part of the Multicultural Philanthropy Project, funded by the W.K. Kellogg Foundation. A series of fourteen guides examine the ways in which various gender, ethnic, cultural, religious and racial groups use their gifts of time, money, and talent. They reflect the ways giving and voluntarism are embedded in American life and challenge the notion that philanthropy is the exclusive province of elites. The guides include discussion topics, research questions, and literature overviews with annotated bibliographies. They were developed both to integrate the study of philanthropy into the curricula at colleges and universities, and to provide a tool to nonprofit professionals in the area of development and fundraising. Each volume provides background information on a selected community that will help practitioners work effectively with these groups. 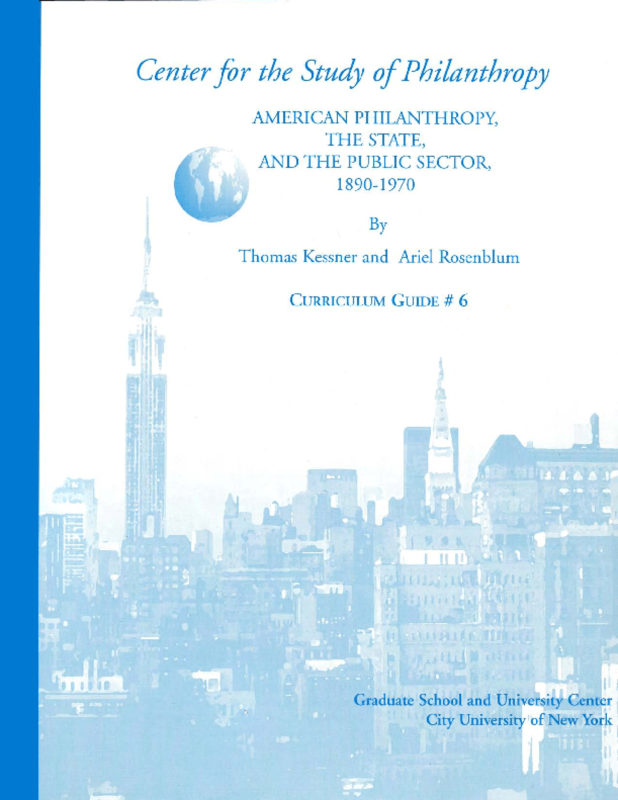 This guide explores the relationship between philanthropy and the American state, examining the process by which the state expanded its programs, institutions, and influence over more and more of both civil and political society. It starts with an overview of the 19th century, charting the rise of a national economic and cultural order, and demonstrating how philanthropy itself adopted the organizational structure and long term planning view of the corporation. The dramatic expansion of the American state between the 1920s and the 1960s was accompanied by an even larger proliferation of private, philanthropic institutions which helped shape public and private policy through the organization of volunteered time, money, and expertise. This proliferation reflected a commitment to relying on private knowledge, expertise, and institutions in the development and execution of public policy and a liberal political structure which tried to remain decentralized, ad hoc, and essentially private. Philanthropic institutions played an important part in contributing to the contradictory development of a large-scale state that kept the trappings of a restrained government that depended for crucial input upon a third sector of volunteers.